It didn’t disuade me either and, via the following year’s World Championship heat in Lichfield and EQC in Belgium, we all ended up at that meeting in Bucanneers’ Rugby Club and the founding of a national quiz organisation. As the initial spark for all these ideas had been David’s appearance on radio, it was entirely appropriate that he was elected, unopposed, as the new organisation’s chairperson. Last November, David was part of our Irish team at the EQC in Tartu. 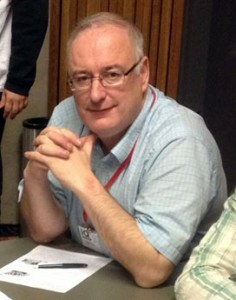 He was in excellent form, especially during the team quizzes. On the final day, he joined forces with Lorcan Duff to finish 16th in the Pairs. It is the highest result yet by an all-Irish pair in the EQC. It’s sad to think that he won’t have a chance to improve on that next year. Sadder again is that he will miss out on the inaugural Tri-Nations Tournament in Edinburgh next April as he so loved creating and cultivating friendships with quizzers from other nations. He will miss it and we will definitely miss him. David passed away on Christmas Eve. He is survived by his sister Ann, brother Peter, in-laws, niece and nephews. I read somewhere that he holds the record for the most consecutive correct answers in the general knowledge quiz found under “probably the best quiz in the world”. I am impressed. That’s really sad news….condolences to all his family and those who knew him well.